If you are someone who is interested in investing or just like to follow your favorite stocks, Market Pulse HD by More Solutions is for you. 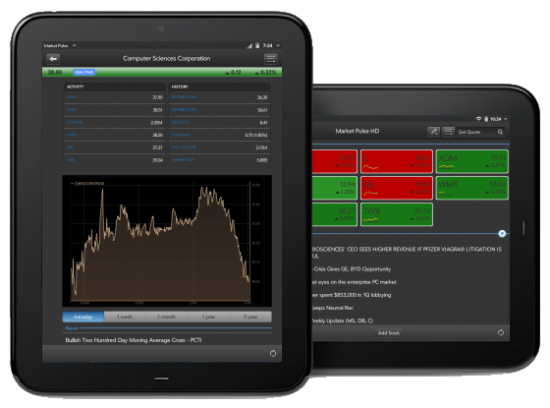 As a followup to their webOS mojo app MoreStocks, Market Pulse HD was developed using Enyo specifically for webOS 3.0 and the Touchpad. The layout of the app does a great job utilizing the extra screen space of the tablet to maximize the information available to you, yet it does not feel cluttered at all. At $3.99, Market Pulse HD is already available in the App Catalog as part of the first batch of "developed for Touchpad" apps, and is definitely worth checking out. Bluetooth keyboard support for webOS was added in version 2.0, but it wasn’t February that we got our first official webOS keyboard. Well, to be more accurate, we got our first official look at the webOS keyboard. Today, we have one in our hands, and we’ve got to say, it’s nice to have and it works well with the HP TouchPad. The HP webOS Bluetooth Keyboard is a full-size chicklet-style QWERTY keyboard with a number of webOS function buttons. The top row contains is completely dedicated to webOS, starting out with a notifications button, followed by Just Type search, virtual keyboard toggle, brightness down and brightness up, back, play/pause, and forward, mute, volume down, volume up, and power. The next four rows are standard QWERTY, and the bottom row gains card view and Symbol buttons. The card view button is funny, in that it actually simulates an upswipe (just like the front button on the TouchPad). So the first press puts the current app into card view, followed by repeating opening and closing of the app launcher. Once you’re in card view, there’s no way to use the keyboard to move between apps or select a new app to come into focus. It’s a limitation of webOS, really. If there’s any app that’s going to be the key to the TouchPad’s success, it’s the App Catalog. And if there’s any app that feels most out of place, it’s the App Catalog. For all of the Enyo-y goodness that are the sliding panels, that’s nowhere to be found in the App Catalog. Instead, there are literally back buttons throughout. In fact, it's the only pre-installed app with a back button. Compared to the smoothness of the rest of webOS, the back button is just jarring. That out of the way, let’s actually talk about the Catalog. 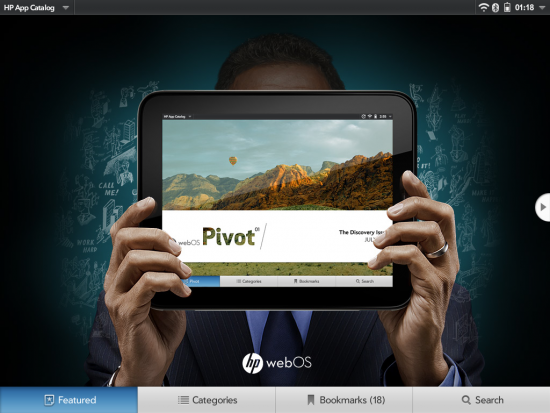 The first thing you’re presented with upon launching the App Catalog is a new feature called webOS Pivot. Pivot is an App Catalog magazine of sorts, complete with a table of contents. The app reformats itself in vertical and horizontal, and works entirely by swiping left-right to get to the next page. It contains features on app developers, individual apps, and just using the TouchPad as part of a digital lifestyle. When discussed, the apps are linked live, either to the App Catalog listing or containing a Launch button if you’ve already got that app installed. 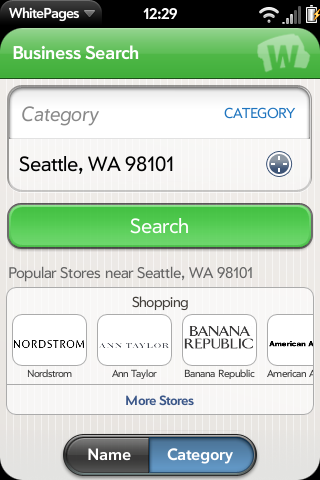 Pivot is also the first place you’ll see the bookmark icon, which lets you save an app listing for later. Once you get into the app listings, it’s paired up with every individual app. Pivot is planned for new issues every month, and each issue will be custom tailored to the market in which it is being distributed (i.e. Germany will get a different issue of Pivot than America). The first webOS tablet: a legitimate iPad contender, or just another wannabe? One year ago Friday, HP completed its acquisition of Palm. HP was the shining knight to Palm’s damsel in distress. 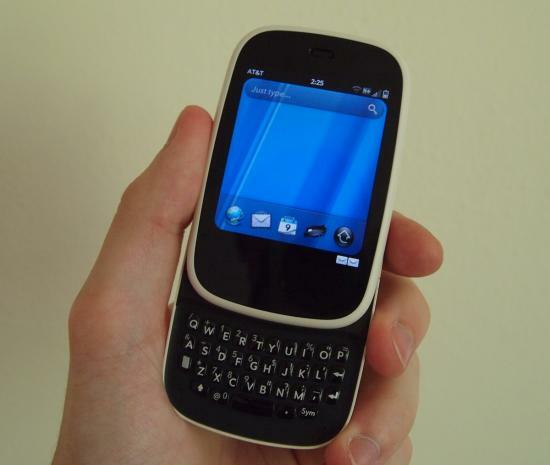 Palm’s webOS strategy had not panned out and the smartphone pioneer was a few months away from bankruptcy. It was a tough time for the webOS faithful, and though the purchase by HP was met with celebration, it was also looked at with wary eyes. In the year since, HP and the new Palm Global Business Unit released two devices: the underrated Palm Pre 2 and the tiny HP Veer. This all changes on July 1, 2011, with the HP TouchPad. Both the Pre 2 and Veer (as well as the upcoming HP Pre3) are products of Palm engineering. The TouchPad, however, is entirely an HP product. When HP bought Palm, it had no tablet prototypes or operating system in development. It took just seven months for HP and Palm to pump out the TouchPad and webOS that we saw in February at the Think Beyond event, and there spent the last five months refining both. The result is a fast and capable tablet running a thoroughly modern operating system. There’s a good and growing selection of apps for the TouchPad, but there are some glaring omissions on the device and in the App Catalog. Despite the areas where the TouchPad is lacking, it’s still perfectly capable and full of potential. So much so that this entire review was composed on a TouchPad. A few months ago when the Phnx Twitter App (pronounced "Phoenix") was in the beta catalog, I asked Dave Strack, the developer of Phnx, why he decided to join a Twitter app market that was already dominated by apps like Carbon, Bad Kitty and Spaz. His answer, "I'm building Phnx to show developers that they can build beautiful apps in webOS, and then inspiring them to get up and do so." Well, Dave, you have met that goal and perhaps even exceeded it. The Phnx Twitter app is a work of art. But don't let the looks distract you from the functionality. While I did run into a few features that I desperately wish had been added to the app, Phnx does allow you to manage your Twitter account pretty easily and catch the stream of content that is constantly flowing through the micro-blogging service. Once you jump after the break you'll be able to see the full review, but the bottom line is, the app is a great one worth checking out if you're an avid Twitter user (and it's on sale right now!). Here at PreCentral, there are two things that we enjoy doing; giving you the full rundown on all things webOS, and keep track of our tasks to get work done. By reviewing this next app, Outline Tracker by Hominid Software, we are able to get the full joy out of both of those activities. You've gotten a look at other webOS productivity apps from us in the past, and now we get to give you a look at one that's been in the catalog for quite a long time. Outline Tracker is a task management, Basecamp-syncing, outlining app that comes in two versions; free and paid (for which we got a promo code from the developer). Both of them come with some pretty nice task tracking features that are essential to good project management. 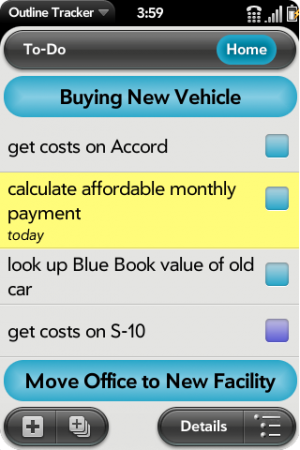 In fact, Outline Tracker Free has all of the same features as the paid version, you'll just be limited to 50 items, either tasks or notes, at a time before you need to pay the price for an upgrade. That price, while a bit much compared to other apps at $19.75, may be worth it once you see the impact it has on your (and your team's) productivity. If you find yourself in need of a simple task manager without all of the features of Outline Tracker, there are some great alternatives (which are a bit cheaper) that we've reviewed before, but Outline Tracker definitely stays at the top as one of the greats for both individuals and groups (especially when you start syncing your Basecamp accounts). There's still a lot more to go through, so click through the break to read the rest of our review of Outline Tracker by Hominid Software. 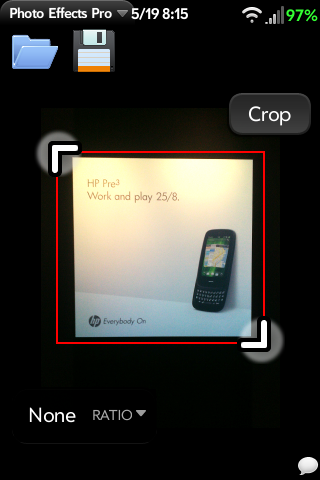 One of the big shortfalls of webOS has been the inability to edit your photos, from simple tasks of rotating, cropping or resizing them to more complex tasks of applying color effects or changing the brightness (and this was only exacerbated by the complete lack of options in the camera app). For those simple tasks, you could do some "editing" by viewing the image in the Photos app, zooming in or rotating the screen, and then taking a screenshot, but that was more of a clever workaround than an actual feature, and then cut your image size down to a paltry screen-size resolution. Developers quickly realized that there was no way to perform these photo editing activities with the available Mojo APIs, some created apps that uploaded the picture to a server, performed the editing actions there, and then downloaded it back to a user's phone. Not ideal, especially since it required a data connection, but it worked. One of the first of these apps was Photo Effects Plus by Rusty Apps. It had a simple interface and worked quite well for the limitations imposed. And then Palm released the PDK that could perform these photo editing tasks directly on the device, but a PDK solution for this type of app was a bit more complex since the developer had to create the entire user interface, including any functionality to access the camera or photos instead of relying on the standard webOS photo picker found is most apps. For that reason, it took a long time before any of those apps were released, but some eventually started to appear such as the recent Image Worker Pro. 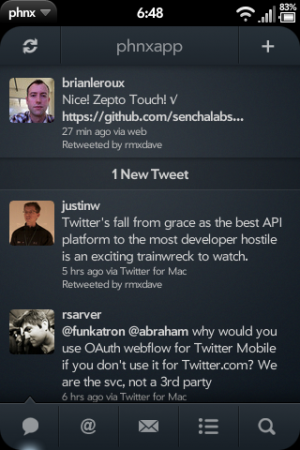 However, they clearly didn't have the look or feel of a native webOS app. This was where the long-awaited hybrid apps were supposed to shine, taking the expanded APIs and functionality of the PDK but incorporated into a standard webOS Mojo app. But for almost a year after the PDK was released, hybrid apps were not yet allowed into the App Catalog. That is, until recently. And as a result, the developer of Photo Effect Plus was able to develop Photo Effects Pro, a new $2.99 hybrid app (only available for webOS 2.1 and above) that is able to do virtually all that the previous Plus version was able to do, and then some, without the need to send your photos off to some server for editing. Developer James Harris, who is known for his work on many other popular apps for webOS, was hired by WhitePages to build a webOS client for their service, so we knew that this was going to be an excellent app from the start. What we didn't expect, though, was that the company would be officially supporting homebrew patches that integrate their app even more completely with the platform. That's what makes this review a little different: with a homebrew patch and an app that work so well together, we had to give them both a look. Overall, the app, which is available for all current webOS devices 1.4.1 and up, is a solid one. The ability to be able to look up contact details for any business, person or doing reverse lookups (inputting a phone number to find the person behind it) is invaluable on a smartphone. I'm finding this app replacing others that I have been using up until now, and it's saving me a whole lot of time by keeping the Google Maps app from loading (for five minutes) each time I want to search for something nearby. After the break you'll get the full app-rundown and we'll also take a look at the patch that's included, as well as integration with another of James' Apps, Mobile Florist, to show what other developers might be able to do in the future to integrate their apps to the WhitePages database. When the original Palm Pixi debuted on Sprint, we fell in love with the form factor and were then immediately turned off by nearly everything inside the phone. While Palm was able to fix it a bit by adding Wi-Fi to the Pixi Plus, the little webOS phone that could have been never really lived up to its potential. Fast-forward a year and a half to today and we now have the HP Veer. It's coming first to AT&T (and branded as the Veer 4G, thanks to AT&T's ever-changing definition of what constitutes '4G') on May 15th and so far it looks like it'll be exclusive to that network. The Veer packs the guts of a powerful smartphone in an incredibly small and attractive package.